Posted January 24th, 2019 at 5:28 pm | Log in to reply. Where did you get your jar? That is a great, I love it! Posted February 27th, 2019 at 8:46 am | Log in to reply. I bought it in a Korean grocery store. You can find it in a large Korean grocery store in the kitchenware section. Posted November 28th, 2018 at 11:33 pm | Log in to reply. i do not have a glass jar, is it ok to you the lock and lock kimchi container instead? Posted December 2nd, 2018 at 9:30 am | Log in to reply. Posted April 28th, 2018 at 7:03 pm | Log in to reply. it’s my second time making your dongchimi recipe. it was absolutely delicious the first time! the problem is i forgot how long i let it undisturbed before eating it. all i remember is it getting better and better over time – though the texture of the radishes was not as good (they were devoured anyway), the brine and leaves were to die for. for how long am i supposed to resist before opening the jar? Posted May 3rd, 2018 at 8:51 am | Log in to reply. Let it sit at room temperature for 2-3 days until it ferments. After that keep it in the fridge. This kind of kimchi with a lot of water has to be eaten in 2 weeks otherwise the radish will go soggy. Posted November 28th, 2017 at 11:37 am | Log in to reply. Thank you for this! When I lived in SK, there were several restaurants I ate at that served very sweet dongchimi. Too many recipes call for lemon-lime soda (… Chilsung Cider) or sugar. Your recipe suits my tastes perfectly (my Korean wife’s tastes, as well). I can’t wait to try it. I’m growing a bunch of chonggak in my garden right not, but not all are forming bulbs. Their greens are going into your donchimi recipe! Posted June 13th, 2017 at 5:18 am | Log in to reply. Hi, Can I make this with dikon? Posted August 1st, 2017 at 4:32 pm | Log in to reply. Yes you can. Daikon is also used to make takuan (japanese pickled daikon) using the same salting process. 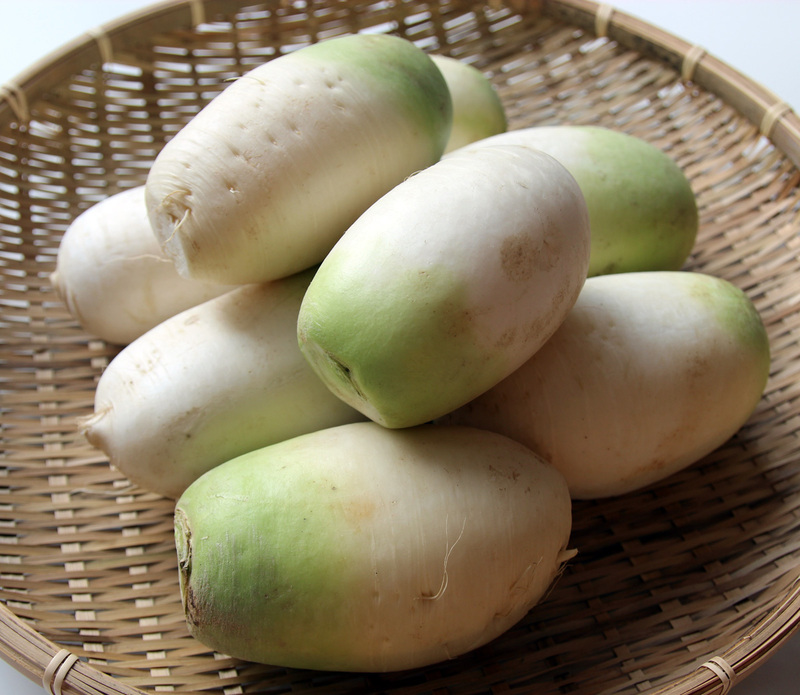 The only difference is “True Daikon” / Japanese daikon is much sweeter than Mu (korean radish). Posted February 18th, 2017 at 9:23 am | Log in to reply. I forgot to put the radishes in the fridge after salting them and now old is growing on them. Do I have to toss them now? Thanks. Posted February 18th, 2017 at 9:33 am | Log in to reply. sorry, mold is growing on them, that is. Posted January 6th, 2017 at 8:45 am | Log in to reply. 안녕하세요 망치님, all your delicious and easy kimchi videos finally made me want to make one so I settled on the dong kimchi. My Hmart sold the dong kimchi radish with the tops on and after cleaning it, I’m left with tons of radish tops! I know my mom would never throw this away! Lol. But in your video, you only used the small radish tops in the dong kimchi recipe and I heard most people omit these and opt for smaller radish tops or 갓…?? Any suggestions as to what I should do with my radish tops? Thank you! Posted October 26th, 2016 at 2:18 pm | Log in to reply. I’m making dongchimi for the second time now. I can’t wait for it to be ready! Posted October 27th, 2016 at 10:34 am | Log in to reply. wow, the radish looks so tasty! When it’s fermented, it will be really tasty! Posted September 14th, 2016 at 11:34 am | Log in to reply. can i use ponytail radish instead of korean radish?im sure there is no korean radish and daikon in small city. Posted September 20th, 2016 at 12:50 pm | Log in to reply. Yes, ponytail radish will turn out delicious, too. Posted August 9th, 2016 at 3:09 pm | Log in to reply. I love this recipe! I’ve made it at least 4 times now, whenever I find good sized radishes at the Korean market or at the farmer’s market. The first few times, I did not have cheese cloth, so I used the fine mesh netting bag that lemons come in. I just knotted it at both ends! The other times, I used a cloth drawstring bags made for aromatics. I think that netting or cheesecloth are better, because they let the water move through better. After lots of searching for a big jar, I settled on a large glass Fido jar. Although the mouth is a little small, it works just fine! When I keep kimchi in plastic, I find that the smell does not come out if you want to use it for other things later (I don’t have a dishwasher!). Posted July 23rd, 2016 at 8:58 am | Log in to reply. Thank you for this Maangchi! I have just tried some of the dongchimi I made using your recipe and it tastes so good! I can’t wait to make dongchimi guksu as it’s been so hot recently. Posted July 25th, 2016 at 12:50 pm | Log in to reply. “…my stomach was born in the wrong country as I have really old fashioned Korean tastes” It’s so funny! You are going to make dongchimi noodle soup with your homemade dongchimi! Yes, you definitely know Korean food and make an effort to get the real Korean taste. Posted December 23rd, 2015 at 9:10 pm | Log in to reply. Hi Maangchi, I recently visited Korea and learnt about this dish Dongchimi. I love it so much and wanted to make myself. Try your recipe but I might have put in too much sea salt. What can I do then? Thanks for sharing your comment. Posted December 24th, 2015 at 7:05 am | Log in to reply. don’t worry, this saltiness may slow the fermentation down a bit, but won’t affect the radishes themselves. To serve, you have to dilute the broth down with water anyways. Posted December 24th, 2015 at 10:04 am | Log in to reply. Boil some water and let cool thoroughly, add crushed pear (any kinds of pears), then strain and squeeze out the pulp from the pears. Add it to the salty dongchimi and mix it well. it will taste good. Posted May 18th, 2015 at 7:31 pm | Log in to reply. Posted May 19th, 2015 at 10:34 am | Log in to reply. “c u in a month of maassaages” haha, you are so funny! Good luck! Posted May 3rd, 2015 at 5:53 pm | Log in to reply. so, now to make my Kkatdugi, and tomorrow a large pot of Baechu Mak Kimchi! and BTW another question: can I add sauejeot AND some of my fermented squid in my Baechu K.C.? If I watch out for the salt content? and thanks again for all the fish! Posted November 29th, 2014 at 5:29 am | Log in to reply. Unfortunately, it’s hard to get my hands on good Korean ingredients where I live. So I improvised with turnip. Everything is in the can and now I’m waiting for the result!